Majoring in economics, while in University Frank Leo always saw the Real Estate market as a business where he could express his marketing flair, and tenacious personality. After University he took out a loan and devoted himself to learning as much about the Real Estate industry as possible, an endeavour that required long hours, endless courses, and many seminars. Right from the beginning, Frank knew that he needed to implement a system. A system that could create an incredible amount of exposure for his client’s properties, giving them a competitive edge, while at the same time providing the best service possible. Such a system took a tremendous amount of development and great financial investment. It also needed time to refine and implement. Frank Leo started in the Real Estate market in the recession of 1990, just as the market went into its worst performance since the great depression that started in October 1929 and lasted for many years. As he persevered through his initial year, he continued to refine his plan and system. The nickname of Leo “THE LION” became a household name and a continuous quest for a marketing edge and superiority. Frank Leo registered the trademark of “THE LION”® because he knew the power of this kind of marketing and advertising exposure. Using many marketing techniques to draw attention to his name and his client’s properties, Frank continued to build the ultimate Real Estate business, constantly improving and never settling for less than the best he could be. What good is a name if you don’t have the goods to back it up? Frank Leo joined Re/max West Realty Inc. in 1993 and began to put together an extraordinary Real Estate business. His confidence and understanding of the Real Estate market won him the respect of his clients and colleagues. Frank continued to develop his business by adding a professional assistant, administrative manager and a marketing coordinator to make his support staff complete and ensure smooth operation, providing the best service and results possible. The total package was ready in 1995 and implemented. That year, Frank Leo swept the Re/max West Awards Gala including the #1 Top Producer Company Wide. Never looking back he has held that spot every year, earning the highest Re/max International Award Annually, “The Diamond Award”. Frank has been honoured as a Member of the Re/max Hall of Fame, Lifetime Achievement Award and the Prestigious Circle of Legends Award. Most notably Frank has been honoured with the Highest and Most Exclusive RE/MAX Award – Recognizing the Highest Level of Achievement In All of RE/MAX, The Luminary of Distinction Award, representing $20 Million Plus in Total Commissions and 20 Years Plus with RE/MAX. In addition, Frank is the #1 Broker in Toronto (Central, East &amp; West Combined) by Units of Listings Sold for All Companies of All Brokers and Sales Representatives for 2015, 2016, 2017 and 2018. Frank was recognized as the #1 Individual Re/max Agent in Canada (by Transactions) in 2015, and #2 Individual Re/max Agent in the World (by Volume) in 2015 & 2016. One of Frank Leo’s most impressive accomplishments was being awarded the #1 Individual Re/max Agent World Wide in 2017 (For Dollar Volume) considering that Re/max is in over 100 countries. Most recently, Frank Leo and Associates were recognized as the #1 Re/max Team in Ontario, the #2 Re/max Team in Canada and the #5 Re/max Team in the World (For Dollar Volume in 2018). The willingness to spend the extra dollars to get results for his clients definitely makes him stand out. A marketing plan refined over the years designed to create incredible exposure and awareness. He is a very experienced powerful negotiator delivering amazing service. Frank and his professional support staff are the total package. Frank’s goal and commitment is simple “GET RESULTS” for you whilst making each transaction progress smoothly with the least amount of inconvenience and still create the incredible awareness needed to get the best possible price. The professional staff is an extension of Frank Leo to help him be the best he can be. They provide you with personal service you deserve with big business results. Frank is continuously looking for ways to improve his service and increase exposure no matter how good it already is, keeping as advanced as possible through technology. Let’s just say he has an unquenchable thirst and desire to get the best possible results and give the best service at all times. I take pride in being able to deliver for each of my clients. Don’t just take my word for it. Take some time and read some of these client testimonials. From me, all the way down to my supporting staff, our team puts you and your family first. Our goal is to maximize the dollars you earn when you sell your Toronto home, because you deserve it. Watch a video discussing our core values. Frank continues to be a proud supporter of many community organizations. Come see how we’ve supported communities in the GTA in the past. Our dedication for helping clients find and sell their Toronto home has brought both us and our clients much success. We take a lot of pride in our achievements, accolades and award winning results. With over 25 years of experience in this industry, I know what it takes to sell your Toronto home. I literally wrote the book on it! 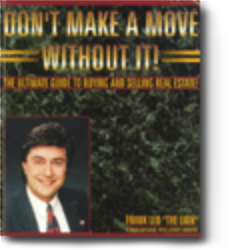 Read more about my book, “Don’t Make A Move Without It!”. YOUR HOME IS YOUR LARGEST INVESTMENT!